While we’re painting our house, it might be time to do some other upgrades to the exterior, like replacing our old front doorknob. I actually don’t mind the looks of what we have because it’s brass and shiny, but it’s tricky to use, which is a real pain when you have a kid in one arm, groceries in the other, and are fumbling with a key that keeps getting stuck. 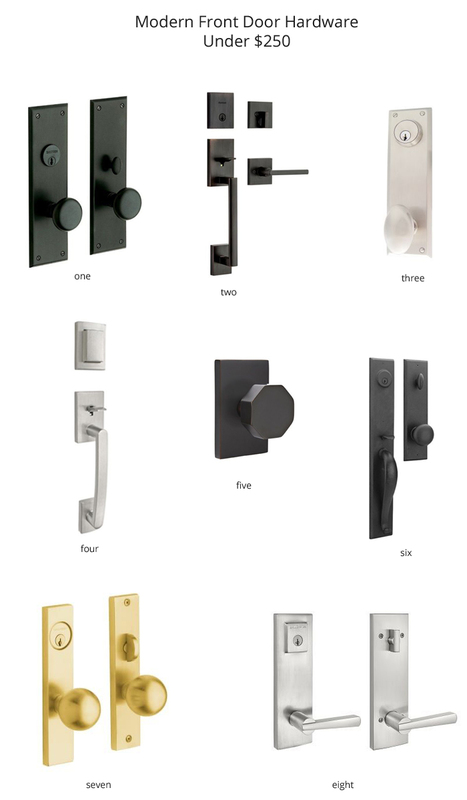 It would be nice to find some modern door hardware to replace what we have, and there are lots of pretty options out there… they’re just really pricey. I had no idea that a doorknob could be so expensive, but if you start shopping around you’ll see that entryway door hardware can run upwards of even $600! (whaaaat?!) — and most sets are in the $200-300+ range if you want something with style (like this gorgeous $400 handleset in black and walnut). Since that’s not in our budget, and I’m guessing probably not in most of yours either, I’m sticking with $250 tops, but keeping my fingers crossed we find something we like for a lot less. The matte black options would look great with our black mailbox and exterior light fixture, but we’re not picky. A lot of these pictured come in several finishes. I also personally prefer a knob to a lever, but again, I can live with either. My two favorites are, of course, the two most expensive (1 and 7), but I think all of these have potential, depending on what will actually fit on our existing door. Have any of you ever replaced a front doorknob? Any tips and tricks we should know? Go with a knob. It will take longer for the kids to learn how to open it . We have installed alarms on our doors now that Brady can unlock and open them. Joey already knows how to use a doorknob and open doors! But yes, I think knobs are definitely a better option with kids. Unfortunately they aren’t as common as levers and often cost more.